Coptic John 1:1c: Indefinite or Qualitative? Certain Trinitarian apologists attempt to argue for a qualitative meaning for Coptic John 1:1c, as they do for the Greek text. Whereas the Greek text of John 1:1c is anarthrous, creating some ambiguity, the Coptic text is different. It is unambiguous: it is indefinite. But Trinitarian apologists keep trying to find a way to make it qualitative, even to the extent of confusing it with other classes of Coptic nouns. According to Helmut Satzinger, the Coptic articles are used in this way: Definite ("the"), indefinite ("a", "some"), and zero (generic, abstract, quality). -- "On Definiteness of the Coptic Noun," Actes du IVe congres copte, Louvain-la-Neuve, 5-10 September 1988. 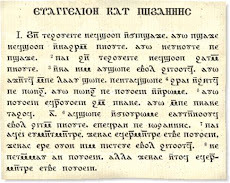 But the Coptic translators wrote neunoute pe psaje (ne ounouti pe pcaji, Bohairic), using the indefinite construction. The Coptic evidence is clear and unequivocal. Their translation was a matter of choice, and the choice they made was to render it in a way that translates into English literally as "the Word was a god." Only if they were using the word ounoute, "a god," as a derived adjective would the meaning be "one possessing the quality of god." Understanding John 1:1c as "qualitative" in this generally-recognized sense is not objectionable, as detailed in 1984 in the New World Translation Reference Bible's Appendix 6A. What is objectionable is the attempt to philosophize or theologize "qualitative" to mean that Jesus is "fully God" or "God Himself," as some translators have done. The Coptic text does not support such a rendering. According to Coptic grammarian Dr. Bentley Layton, the Coptic definite article represents "the most typical or essential instance of a class.... 'God' always takes p- [the definite article] when referring to the God of the Bible." -- A Coptic Grammar, with Chrestomathy and Glossary (Harrassowitz Verlag, Wiesbaden, 2000), p. 38. However, the Coptic definite article is conspicuous by its absence at John 1:1c. George Horner’s use of brackets around the "a" in his translation of John 1:1c is contradictory to his use of the "a" in the similar Coptic construction elsewhere in his translation. Horner even translates the "a" without brackets in places where it truly is not needed in English translation. So doing that at John 1:1c in his translation is not a matter of grammar at all, but lies somewhere else. Concerning John 1:18, certain Trinitarian apologists state that the use of the definite article there can be translated only as "God," as George Horner does in his version. If true, then why do most versions translate that definite construction differently at Acts 7:43, where they read "god"? Although God in the Coptic Bible always has the definite article, Acts 7:43 demonstrates that not every instance of the definite article before noute refers to God.The reference to "god" at John 1:18 is anaphoric and demonstrative, referring to the same person mentioned previously at John 1:1c. And John 1:1c is indefinite in the Coptic version. To turn the backward reasoning of the apologists around so that it makes sense, it does not follow that the Coptic translators would understand noute, god, to be indefinite at John 1:1c, which they in fact do, and then translate it with definite meaning at John 1:18. Therefore, it merits stating again that there are solid grammatical reasons for translating Coptic John 1:1c as "the Word was a god" or "the Word was a divine being." Or less literally, but having the same meaning, "The Word was divine." That is so clear from the Coptic text that the disputing must be driven, obviously, not by grammar, but by theology of a particular stripe. Interesting. Is there no lengths they won't go to to convince temselves of their un-Biblical teachings? Eventually I suppose the trinitarians will ust gang up in force of numbers and agree to agree that there is some special rule of Coptic grammar that only comes into force for John 1:1c. Anyone who disagrees with the majority will then be branded as 'unscholarly'. Thanks for your comment. That is certainly true for what they have done with the Greek text of John 1:1c, even to the point of making up their own "rules" of grammar. However, even if they do, the rest of the Gospel of John shows clearly the relationship between God and the Word, and it does not agree with Trinitarian theology.